Your order will look like this. 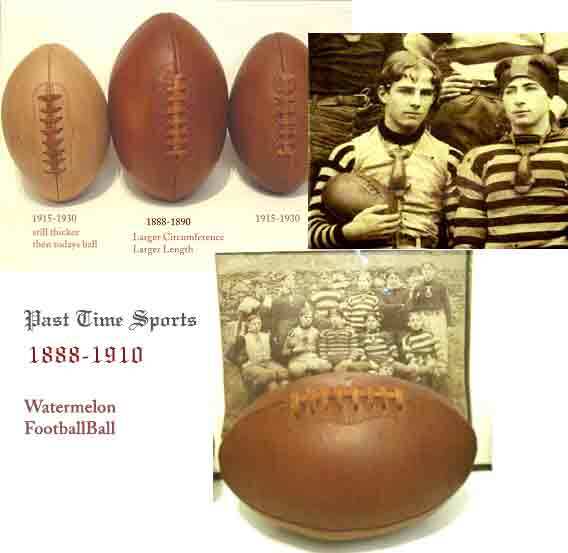 W aterMelon Football is much larger than any football in the modern era. 15 inches and with a large circumference of 25 inches around. These type balls were used in the 1880s even before the leather football helmet. 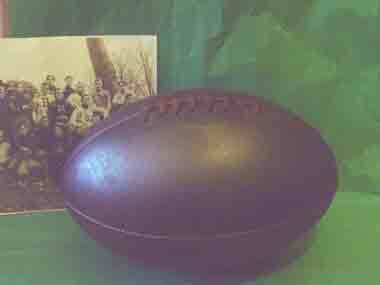 This rare ball was eliminated around 1913 with the first NCAA passing football changes . . . that madethe ball smaller for pasing. (see our first passing ball which we also sell) But , the above pictured large, beautiful, antique style football is of fine leather and hand stitched and hand sewn . Use it to dropkick and latteral but remember No Passing !! Around 1882 and before point scoring in football was non existant...There basically was no scoring or point keeping. The winner won by goals or achievments of goals.Goals were kicks made from the field thru the wooden uprights. Also Four touchdowns equaled one goal, and a goal kicked after a touchdown took precedence over even the four touchdowns. They added up the number of kicking goals and touchdowns to decide the winner. Points were not given for these at first. So, if you scored touchdowns and missed the kicks you did not get any kind of goal. Four touch downs were equivalent to one field type goal. Confusing isn't it? But those were the earliest rules. It even gets more confusing when understanding the use of a safety in the old rule days.. Teams often used the safety to their benefit; since at first, a safety did not count against the team making it nor for a team creating one. In the earliest days a safety had no points associated with it. Teams used it extensively to get a free kick from their own 25 yard line to get the ball away from their goal. Often teams who were pinned near their goal line would run behind the goal line and touch the ball to the ground -thus , giving them the opportunity to have a free kick from their own 25 yard line to send the ball far down the field ; away from the danger of not being able to move it or maybe fumbling it near their own end of the field.. So often...very often, teams used this safety rule to get the ball far away from their goal. And , because there were no points given to the other team when this occured it was overused and made for very close and many tied games. This overuse of the safety soon lead to great controvery and the start of some early scoring decisions to break the many ties. Here is how it began to work against those over using the safety rule..... - if a team had no kicking goal or touchdown by the end of the game -the team that had 4 less uses of the safety would be declared the winner. There were still no points for the safety and it only counted when the game was tied. So, in 1883-4 Walter Camp (considered the father of football) introduced a scoring point system which was adopted. In 1883 a goal kicked from the field was given a value of 5 points. (the best you could achieve). Legend and fact tell of many men who kicked 60 plus yard field goals both being held on the ground and also by being drop kicked. A goal kicked after a touchdown was given a value of 4 points. And a touchdown only brought 2 points. And finally a safety was worth 1 point -a negative forced against the team that had to make it. 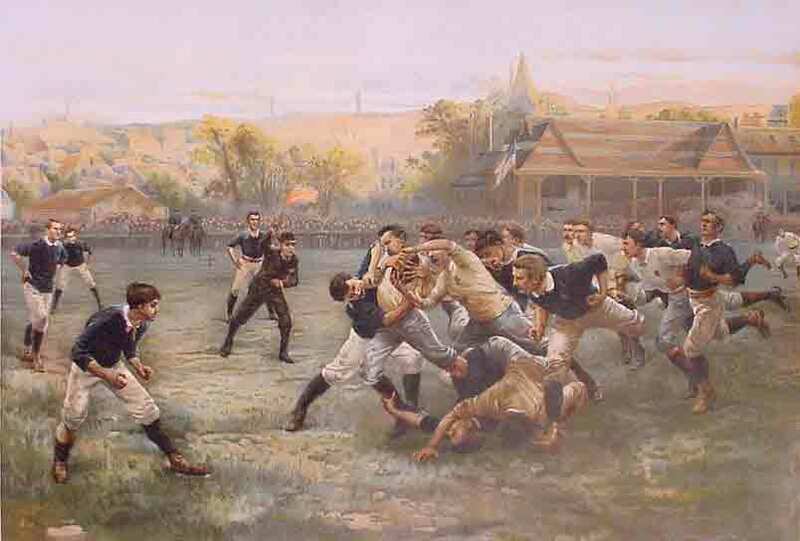 As the game continued to evolve around 1885 it became clear to everyone that a touchdown was the hardest thing to achieve...even harder then a goal kicked from the field...which up to then was worth 5 points. So in late 1884-1885 a touchdown was given a new value of 4 points! The field goal still stayed at 5 points and the goal after the touchdown was reduced to only 2 points. And the safety was raised to 2 points as well. Then again, in 1897 the touchdown was raised to 5 points and the kick after a touchdown was dropped to 1 point. (our modern day extra point) The field goal fell to 4 points in 1904 and to 3 points in 1909. In 1912 the touch down finally achieved its value of 6 points that has remained the same till modern times. This 1912 change -touchdown -6 points , kick after touchdown 1 point , field goal 3 points , and safety 2 points remained unchanged for some 46 years . Where in 1958 the rules allowed a team to go for two points after touchdown with a running or passing play. This was done to help reduce the number of ties and it worked and was considered a success. effectiveness in particular was St Louis University winning many mnay games with it. Still the pass was scorned by the big East Coast teams ..especially Army and the Ivy leagers. But out in the Mid West teams began to see its advantages and that's how Notre Dame used it to become a national Power under Knute Rockne . That;s another story for later. 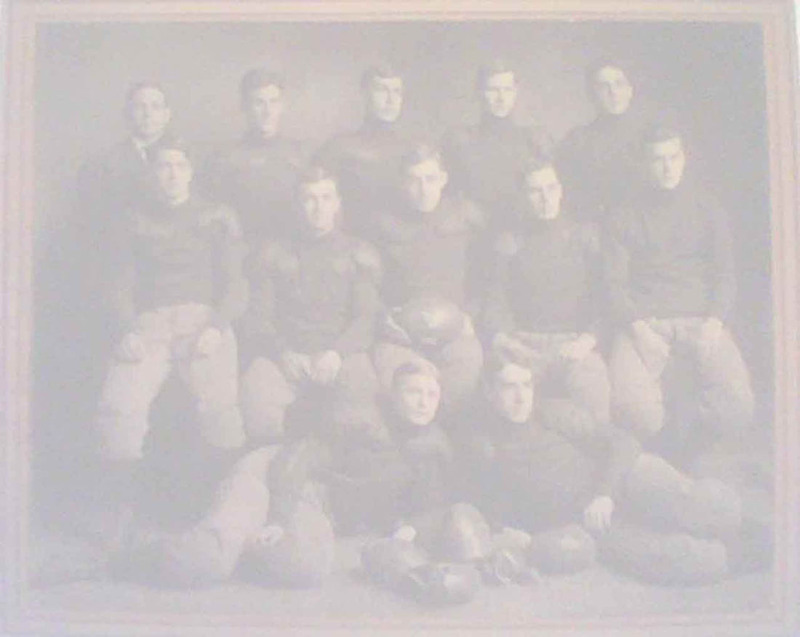 As in 1913 Notre Dame used the Pass to beat the super Power of Army by a score of 35 to 13!